conserving and managing resources in ways that are fair to present and future generations. What native animals are shown as living in old growth forests? 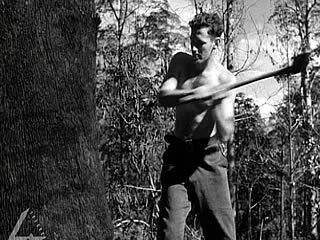 How have Australians attitudes to tree felling changed since this clip was produced? What are the issues affecting the environment through logging old growth forests? What solutions are recommended by environmental organisations? What can we do to ensure that Australia’s old growth forests are sustained? Go to The Wilderness Society for current issues concerning logging and the environment. Go to Paper Trail a video clip from australian screen which charts the history of logging and its effects on the environment.